Create 3-D games—and you don't even need code! Build the ultimate on-line office. Control real hardware from a USB connection. Put on your publisher's hat and let open source do the heavy lifting. Monitor your processes in real time when you're away from the office. 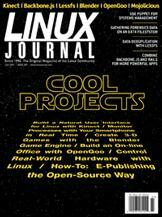 Build a Natural User Interface for Linux using the Microsoft Kinect. Reduce redundant copies of data with data deduplication. An open-source platform for system management. Dave Taylor's Work the Shell What Day Is That Date in the Past?